Probably the most exciting venue in Norfolk to bird watch during Spring and Autumn plus breeding terns in Summer. Our next ‘trip’ on November 13th is to Norfolk and more specifically to a 6km long spit of mostly sand dunes extending from the northernmost coast of Norfolk. Blakeney Point lies east to west leaving it exposed to the north – hence the first landfall for many birds migrating south from continental Europe. Paul Laurie has been studying and photographing birds for 46 years the last 20 at Blakeney. 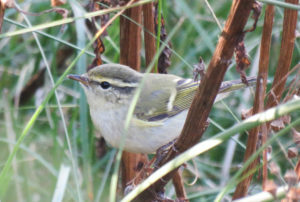 He leads groups who want to find out more about birds and need help identifying some of the more difficult and rarely observed species such as the tiny Yellow Browed Warbler in the photo. Just arrived from Siberia it would normally spend the winter in south east Asia but has turned right instead of left and ended up in Norfolk. Migrants are only a part of Paul’s talk, Blakeney is home to thousands of noisy but beautiful terns in summer. This entry was posted on 16th August 2017 by Webmaster.